Sheila (Kertte) Frazer - Edmonton's Burial & Cremation Professionals | Trinity Funeral Home Ltd.
Sheila (Kertte) Frazer, 69, of Edmonton, formerly of Guyana, South America, passed away peacefully Thursday, Oct. 25, 2018, at the University of Alberta Hospital in Edmonton, after a courageous battle with liver disease. She was born on March 20, 1949, in Guyana, South America. She spent her early years in Pomeroon, but lived most of her life in Eccles on the East Bank of Guyana. After relocating to Edmonton, Alberta, Canada in 1980, she met and married Rolf Frazer on February 3, 1981. 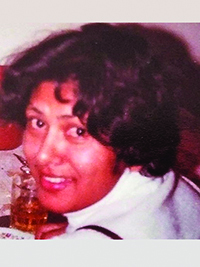 Her greatest joy in life was moving her children Indira Rampersaud and Andy (Cho Tung Sing) Frazer to Canada in 1982. She enjoyed spending time with her grandchildren Aqeel Connor Ali, Malik Aaron Ali, Jayden Frazer, and with family and friends. She is survived by her husband Rolf, daughter Indira, son Andy, daughter-in-law September, her grandsons, Aqeel, Malik, and Jayden, sisters Sursati Gonsalves, Juliet Lakhan, and many nieces and nephews, as well as many good friends. She was preceded in death by her parents Chand and Rampersad. Funeral Services will take place on Thursday, November 1, 2018 at Trinity Funeral Home located at 10530 –116 Street, Edmonton. Viewing takes place from 1:00 p.m. – 2:00 p.m., with services commencing at 2:00 p.m.
Indy my heart breakes for you and your family. Simon and I send our love and condolences. May your beloved mother Rest In Peace. So sorry for your loss, condolences to you and your family in this very difficult time, hugs.